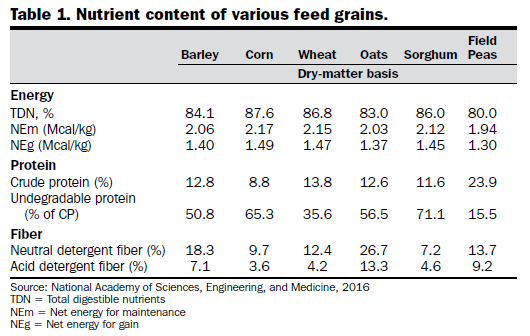 Compared with other feed grains, corn is lower in protein and slightly higher in energy (Table 1). Corn contains approximately 72 percent starch on a dry-matter basis. Other important fractions in the corn kernel include protein, fiber and minerals. The protein in corn is approximately 65 percent escape or bypass protein. Escape protein is protein that is not fermented or degraded by the ruminal microorganisms, but is digested and absorbed by the animal in the small intestine. The remaining 35 percent of the protein in corn is rumen-degradable protein. Ruminal microorganisms require rumen-degradable protein for use in growth and protein synthesis. Most research with corn indicates a substantial benefit to providing rumen-degradable protein in diets containing corn. Backgrounding or finishing diets containing high levels of corn require supplemental rumen-degradable protein in the form of nonprotein nitrogen (urea or biuret); natural protein sources such as sunflower meal, canola meal or soybean meal; or a combination of nonprotein nitrogen and natural protein. 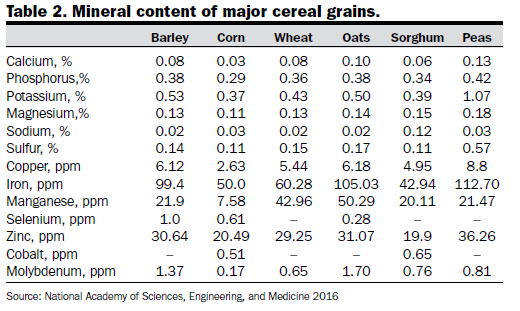 Like all cereal grains, corn is low in calcium and relatively high in phosphorus (Table 2). Diets containing high levels of corn should include a supplemental calcium source, such as limestone, to prevent urinary calculi. The recommended calcium-to-phosphorus ratio in backgrounding and feedlot diets is a minimum of 2-to-1 (two parts calcium to one part phosphorus). Table 3 lists the nutrient content of corn harvested, stored or processed by different methods. In general, different harvest, storage and processing conditions do not result in large differences in nutrient content. The advantages and disadvantages of the different harvest, storage and processing methods are discussed in detail later in this publication. Corn can be used in many different types of backgrounding and finishing diets, and it can serve as a supplement in forage-based diets for beef cows. However, corn is relatively low in protein and high in starch, which can affect forage utilization negatively, especially in diets based on lower-quality forages. Consequently, corn grain should be used in forage-based diets at relatively low levels (less than 0.4 percent of body weight). When corn is used as a forage supplement, ensuring adequate rumen-degradable protein is available is important to prevent any depressions in forage digestibility. Corn can serve as the sole grain source in backgrounding and finishing diets. Depending on desired cattle performance, the level of corn can be varied to supply additional energy in the diet of growing and finishing cattle. However, supplemental protein is needed in most corn-based backgrounding and finishing diets because of corn’s low crude protein content. Even though corn can be fed whole with satisfactory results, cracking or rolling prior to feeding will increase digestibility by 5 to 10 percent. In most instances, grinding or rolling corn will not markedly improve average daily gain, but proper processing will improve feed conversion efficiency. As the proportion of corn in the diet and the cost of corn increase, the benefits of processing also increase because corn is supplying a greater portion of the energy. When corn is fed whole, the animal must process the corn by mastication (chewing). Rolling or cracking corn for use in a mixed ration may facilitate better mixing. Figure 1 shows the relative rates of fermentation for various corn processing methods. Fine grinding corn should be avoided in beef cattle diets because fine-ground corn ferments quickly in the rumen. When feeding high levels of finely ground corn, digestive disturbances, acidosis and founder can occur. Most research with light test weight corn indicates that it has similar feeding value to higher test weight grain. Data from the University of Nebraska indicate light test weight corn (46 to 48 pounds per bushel) has similar feeding value as normal test weight corn (55 to 56 pounds per bushel). Research conducted at South Dakota State University indicates that the net energy value of low test weight corn may be slightly higher than normal test weight corn. ■ High-moisture corn allows for an earlier corn harvest, avoiding difficulties associated with adverse weather. ■ No drying costs are encountered. ■ Marketing alternatives are limited. High-moisture corn that is ground or rolled will be marketable only through ruminant livestock. ■ Improperly ensiled high-moisture corn will result in excessive spoilage and storage losses. High-moisture corn must be stored in an airtight silo (bunker, silage bags or oxygen-limiting structure). For optimum storage and utilization, it should be processed (ground or rolled) prior to storage. Grinding or rolling and subsequent packing of the corn facilitates oxygen exclusion in the silo. In some cases, due to late planting or early frost, corn may need to be harvested before it is mature. The nutrient content of immature corn can be considerably different than mature corn. Table 4 compares the nutrient content of corn at various stages of maturity. In addition, harvesting may be difficult. Immature corn can be harvested as ear or snapped corn after it is dry, or it may be harvested wet and stored in a silo structure as earlage. Frost-damaged corn is generally lower in test weight than normal corn. However, feeding value is generally not markedly reduced. Frost-damaged corn should be analyzed for nutrient content prior to feeding. Corn is a useful feed ingredient. It is high in energy but relatively low in protein, compared with other feed grains. For optimum dietary utilization, corn should be processed by rolling, cracking or coarsely grinding prior to feeding. The decision to process corn should be based on efficiencies gained from processing, compared with the cost of processing.